Yorkshire pair Ashley Hugill and David Grace saw their Dafabet Scottish Open adventure come to an end last night after they were beaten by former world champions John Higgins and Neil Robertson. Leeds potter Grace, 32, was 2-0 up against Australian Robertson in his fourth-round match before eventually bowing out in Glasgow 4-2. 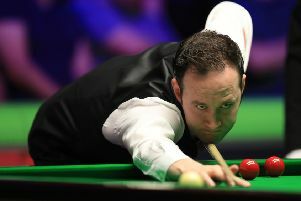 While York cueman Hugill – who earlier in the day had seen off Leeds’s Peter Lines 4-1 – was beaten 4-0 by Higgins, playing in his home tournament. Lines, the 48-year-old from Leeds, had suffered from patchy form at the tournament in Glasgow but reached the third round courtesy of wins over Yuan Sijun and Kurt Dunham. But Hugill, 23, triumphed 4-1 in the all-Yorkshire clash, to secure a mouth-watering meeting against world No 5 Higgins, who lost in last year’s final. “It was tough,” said Lines. “I actually played better than I played yesterday which was alright but it was just one of them games that we both wanted to win to get on TV tonight against Higgins. “The balls were scrappy and it just seemed to go frame after frame, we were both trying to make things happen but it didn’t and he edged a couple of close ones. “I hope he goes on to do well, it’ll be tough because he’s in the tough side of the draw, depending on how results go Ronnie’s still in, Ashley will play Higgins and Neil (Robertson) is still in. Unfortunately, Higgins’s class proved too much for Hugill, but the York potter has impressed this week and gained valuable experience. Elsewhere in the round of 32, Grace progressed into the fourth round with an excellent 4-3 win over Zhang Anda yesterday morning. Grace started well in the match, winning the first frame 84-19 before a break of 56 saw him go 2-0 up. The Chinaman brought things back to 3-3 with breaks of 59, 75 and 52, but Grace clinched the decider with a 67-24 win. Grace, the world No 64, has been in excellent form in Glasgow, beating Alexander Ursenbacher 4-1 in the first round before causing an upset against Scot Alan McManus. The 32-year-old from Leeds edged McManus 4-3 in that match, in the Scot’s home tournament in Glasgow, which will help Grace move up the rankings after he reached a career high of 44 earlier this year. But the Leeds potter’s journey came to an end last night, losing 4-2 to former Crucible champion Robertson, who had breaks of 69, 102 and 124.